Probability Theory and Mathematical Statistics for Engineers focuses on the concepts of probability theory and mathematical statistics for finite-dimensional random variables. 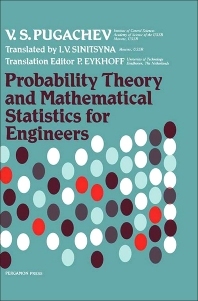 The book underscores the probabilities of events, random variables, and numerical characteristics of random variables. Discussions focus on canonical expansions of random vectors, second-order moments of random vectors, generalization of the density concept, entropy of a distribution, direct evaluation of probabilities, and conditional probabilities. The text then examines projections of random vectors and their distributions, including conditional distributions of projections of a random vector, conditional numerical characteristics, and information contained in random variables. The book elaborates on the functions of random variables and estimation of parameters of distributions. Topics include frequency as a probability estimate, estimation of statistical characteristics, estimation of the expectation and covariance matrix of a random vector, and testing the hypotheses on the parameters of distributions. The text then takes a look at estimator theory and estimation of distributions. The book is a vital source of data for students, engineers, postgraduates of applied mathematics, and other institutes of higher technical education. 10.3.5. Using the Method of Section 3.4.5.